The annual Terroir festival held every spring in Prince Edward County provides the opportunity to sample wines from over 20 different wineries all in one spot, without having to drive all over the County. And since many of these wines are not available in the LCBO, this is a rare opportunity, indeed. It’s also a time when many wineries release new wines, so it’s a great way to catch up with some of your favourite winemakers and see what’s new, or to try something from a winery you’re not familiar with. This wine will be making its debut at Terroir this year, from a winery well-known for its spectacular Chardonnays. It’s richly fruit forward, with notes of candied lemon, orange peel and a hint of peach. It has good weight on the palate, well integrated with a mineral finish. Just 314 cases produced. One of the few wineries producing Gewurztraminer in Prince Edward County (first block planted in 2000, first in the County). This vintage boasts a very complex nose and traditional Alsace kind of feel with subtle perfumes that enhance the lychee and rose water base. Less sweet than the 2011 with a little less botrytis impact. This barrel fermented chardonnay has been cellared for five years, allowing for the complexity and intensity of the oak to mellow. The resulting style is a traditional oaked Chardonnay more akin to an ‘old world’ setting. The tasting profile sees spice and caramel blend nicely into ripe pear and yellow apple notes. This is a delicious off-dry Riesling where the characteristic delicacy and vibrancy are on full display. Winemaker Dan Sullivan says “Riesling is to me, one of the purest expressions a vineyard and winemaker can render. In that sense it is ‘Righteous’ and because it has such a fun, broad appeal – just like Ferris Bueller – it’s a Righteous Dude.” The wine was fermented very cool before finally stopping naturally in early January at a friendly 9% alcohol, and Dan says “From that point on the race was on to capture The Dude and bottle it with all the youthful freshness possible.” Only 190 cases produced. Three Dog Winery is the new kid on the block, with a tasting room opening for their first full season this year. This blend features Vidal with a touch of Riesling. Floral, clear, crisp and refreshing with nice minerality and hints of orange blossom. Be sure to stop by their booth and give this a try. Up next: a roundup of some of the reds that will be offered at Terroir. 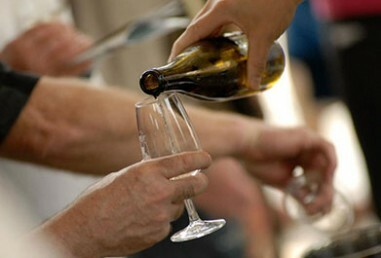 The Terroir festival is on May 3 at the Crystal Palace in Picton. For more info, visit countyterroir.com.